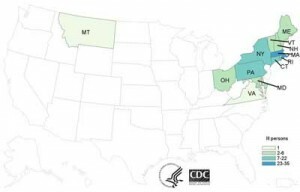 A bean sprout Salmonella outbreak has sickened 111 people in 12 states, according to the latest update from the Centers for Disease Control and Prevention (CDC). Twenty six percent of those who became ill after eating sprouts produced by Wonton Foods Inc. of Brooklyn required hospitalization. The sprouts were sold at stores and served at restaurants on the East Coast. Since the last update on December 4, an additional 24 illnesses have been reported and the outbreak has spread to another state, Maryland. When the outbreak was announced November 21, Wonton Foods agreed to destroy any bean sprouts remaining and close its manufacturing facility for cleaning. On November 24, the firm resumed production and began shipping sprouts again November 29. Salmonella poisoning causes symptoms including fever, diarrhea (which may be bloody), nausea, vomiting and abdominal pain. In some cases, the infection can travel to the bloodstream producing more severe illness. Children, older adults, pregnant women, and those with weakened immune systems are more susceptible to food poisoning than others and should avoid eating raw sprouts of any kind. Cooking sprouts thoroughly kills any harmful bacteria. For those sickened in this outbreak, who range in age from younger than 1 year to 83 years old, illness onset dates range from September 30, 2014 to November 22, 2014. The median age is 34, 64 percent of case patients are female. By state the case count is as follows: Connecticut 3, Maine 4, Maryland 5, Massachusetts 34, Montana 1, New Hampshire 6, New York, 21, Ohio 3, Pennsylvania 17, Rhode Island 7, Vermont 3, Virginia 1.